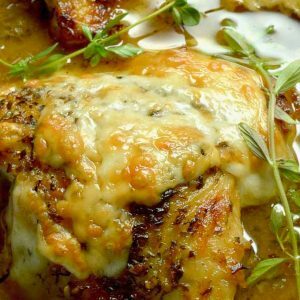 This recipe really taught me how playing with the ingredients can affect the end result. Over the years I’ve tried using different oils versus butter for variations on the moistness. More and less sugar for changing the sweetness. And different ratios of flour and baking powder to change the crumb to the density of the muffins. I’d like to think this is the best variation of the muffin EVER! 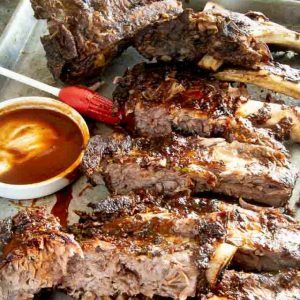 But that’s today and maybe tomorrow I’ll want one that is heavier, sweeter, crunchier, so I’ll say that this recipe is the best version for today! 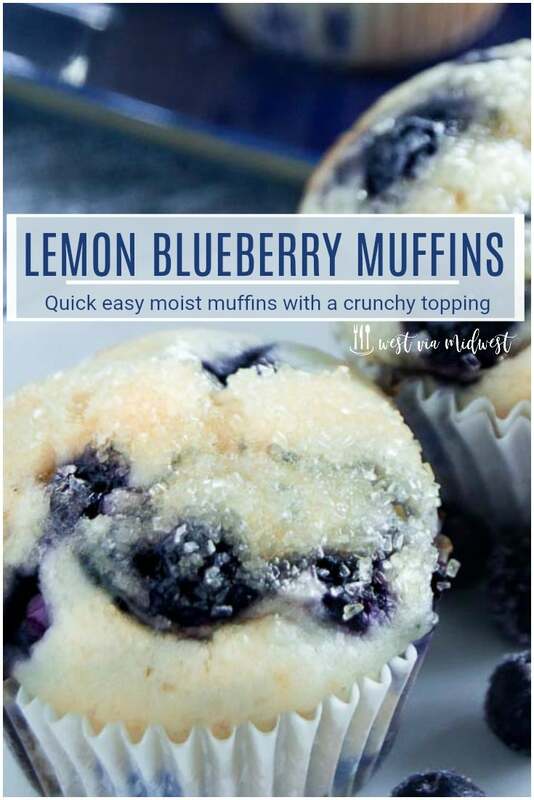 These Blueberry Lemon Muffins are moist on the inside, both from using olive oil and the juiciness of the blueberries. By just using baking powder in this recipe, the muffins raise about 1/3 of what they start out with and the tops crackle and split right before they are baked through so they are a little crunchy on the top. When you make these muffins, as in all baking you must measure carefully. The ratios of flour, baking soda to the wet ingredients of milk, olive oil and eggs will greatly effect the texture of the finished muffin. I use a spoon and sprinkle the flour/sugar/baking soda into the measuring cup. Then use a knife to level it. You can see an example of this method on this Easy Cinnamon Coffee Cake. Lastly, be sure and not overmix them. Stir them just to combine and once you add the blueberries in you stir them around as little as possible to incorporate them. Otherwise the batter turns really blue. But don’t worry, even if you do they still taste great! 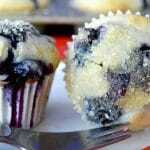 What is different about this recipe for Lemon Blueberry Muffins? For me, the best part of this recipe is the last step before eating them: Melting butter and adding lemon zest for brushing the tops with. Then you can either dip/roll/sprinkle the tops in sugar. 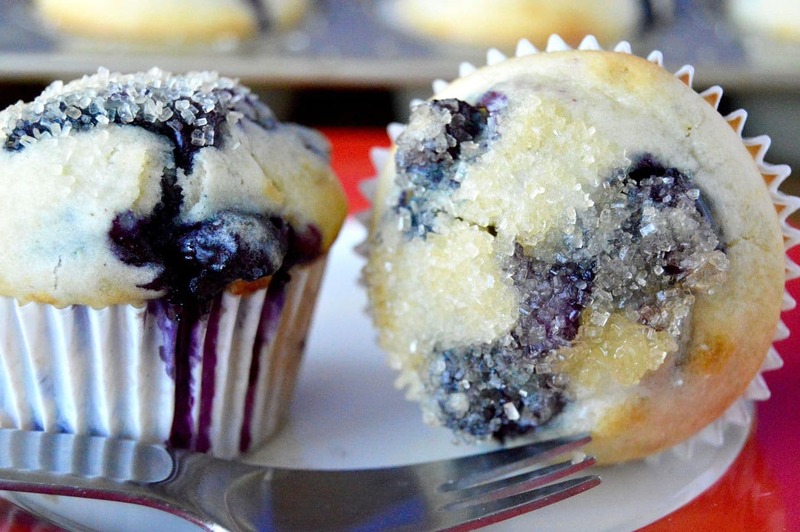 Can you use frozen blueberries in Blueberry Lemon Muffins? MAKE AHEAD? Absolutely! Although very delicious if you do everything at the time of baking, if I had the option I wouldn’t dip them in butter until close to serving time. The tops will stay crunchier that way. 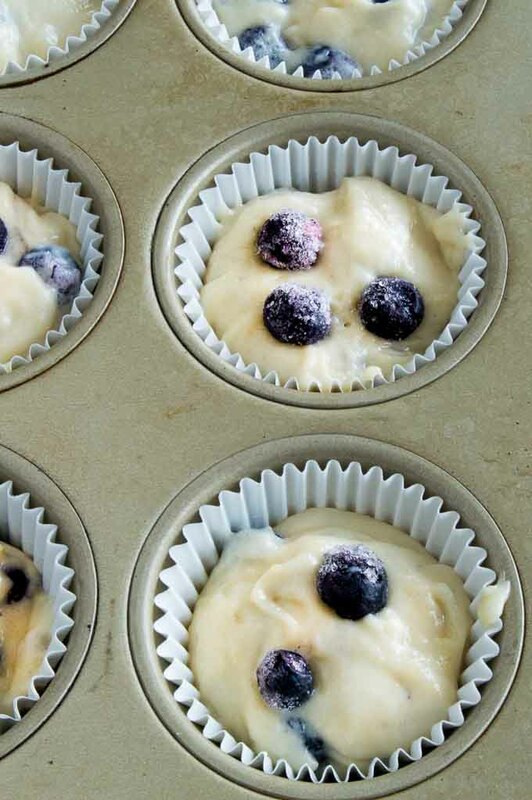 BONUS: This Lemon Scented Blueberry Muffin recipe makes 12 muffins. You can double it, triple it etc, but made as listed, the recipe is great for last minute baking when you need a little something to take for an event. SERVING SUGGESTIONS: Great for on the go, perfect for bringing as a thank you gift, easy breakfast/mid-day snack options. Do you like blueberries as much as I do? Check out my other recipe for Blueberry Mini Tarts Or if you fancy strawberries, check out this one for Strawberry Rosemary muffins! Pin this recipe to your Muffin Board or your FOOD TO MAKE FOR GIFTS board! 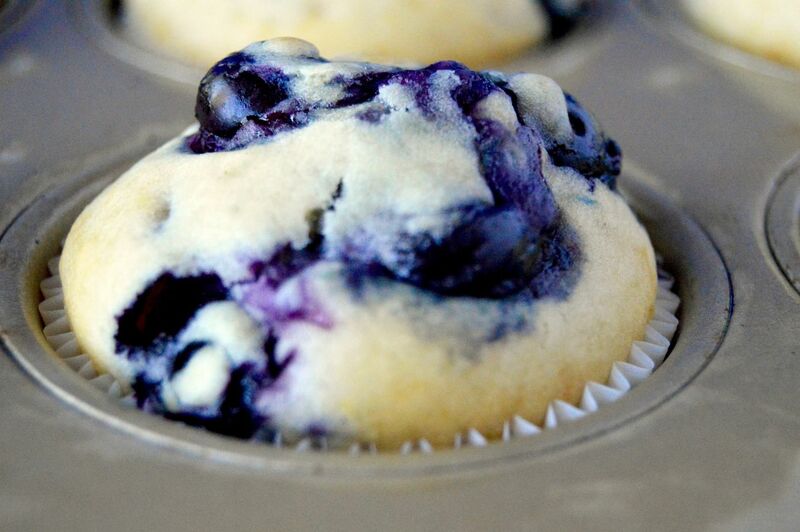 Lemon Scented Blueberry Muffins are moist on the inside, packed full of juicy blueberries in every bite. The top is crunchy and glazed with hints of lemon butter and lastly sprinkled with sugar. Perfect for taking on the go, getting together with friends or to serve at a morning meeting. Lightly grease top surface of muffin tin. Insert muffin liners into tin. In separate bowl blend eggs, milk, oil and lemon extract. Add liquid mix until just combined, do not overmix or they will become tough. Bake 15 mins at 400 degrees on the top rack of the oven. Check at 15 mins, if they are looking too brown move to a lower rack. Muffins are done when a toothpick comes out clean. Once muffins have cooled for 10 mins, gently dip each muffin into bowl of melted butter then into the sugar. Set upright on a rack and let cool completely. 1. If you don't have a sifter use a mesh strainer. Pour all dry ingredients into top and gently shake into large mixing bowl. I usually sift twice to make sure ingredients are mixed evenly thoughout. 2. If using frozen blueberries be sure and rinse if there are any ice crystals on them. 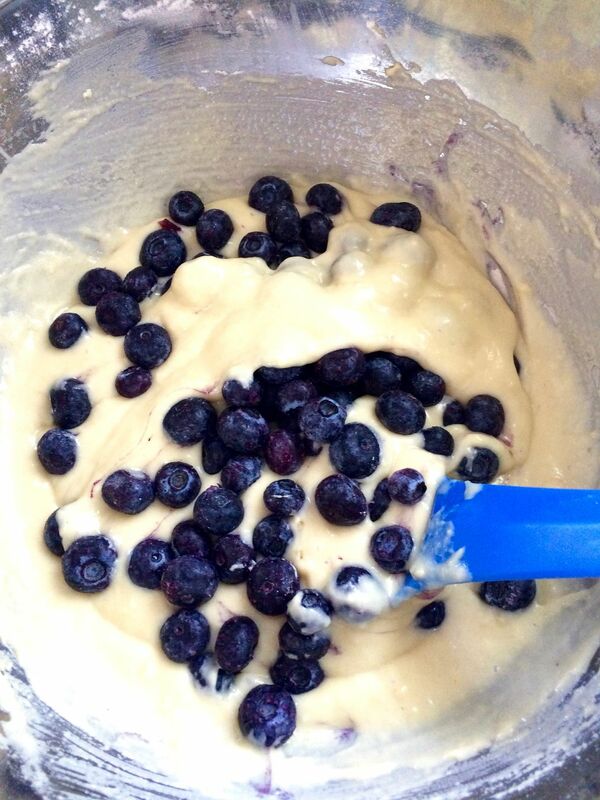 It will prevent your batter from getting watery and stop some of the "blueing" of your batter. 3. I add the a few blueberries to the top so they tops look especially full of fruit. This step is completely optional! These are so super yummy! I love that sugary topping, nom nom nom. Thanks for all your hard work testing and perfecting these tasty muffins! I love that I can use frozen blueberries here too, as I always freeze the leftovers from the farm! Its a tough job testing a lot of muffins but someone has to do it! All for the good of delicious Food! ~m. These muffins look DIVINE! Oh my goodness….looks so tasty! 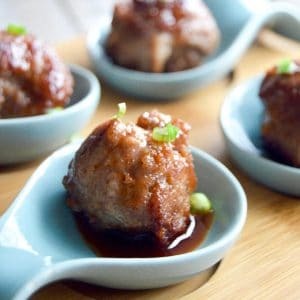 I’m definately making these! Thanks for the recipe! Tried with lime as I had no lemons left, was amazing, great recipe. Left out the butter and sugar dip to keep the calories down a little and still delicious. Is the amount of salt correct? I’ve never added 1 1/2 teaspoons of salt to anything I’ve baked. I made them for my bf’s coworkers but didn’t get to try them. I did try the batter though and to me it was salty and barely sweet. I made these over the weekend. I loved the light texture. They are really good but seemed like they needed a little something to bring out the lemon flavor. I made them again and increased the sugar from 1/2 cup to 1 cup and thought it really brought out the lemon flavor. My husband agrees. I would give these 4 out of 5 stars with the 1/2 cup sugar and 5 out of 5 stars with the 1 cup of sugar. Im glad you liked them Terri! What a unique twist. I love both flavours in muffins so would love to try these – they look so amazing! Blueberry muffins with a lemon scent sounds delicious to my palate. They are great for enjoying in the morning when I am on-the-go to work. I love blueberry muffins. I’ll have to try your recipe, sounds yummy! We love baking at the dollhouse. We’re going to need to try and make these. Oooh blueberry muffins are my favourite. If you have added lemons that is an added bonus and I am pinning that to my recipes to make list! You’re just killing me with the sweetness here. Oh my! 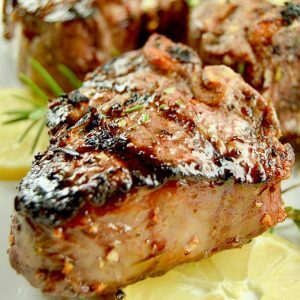 My family will love this and I love how it has that hint of lemon. Sweet and tart at the same time. Perfect! These are beautiful!! Love the big blueberries!! What an amazing combination! It all sounds so perfect. 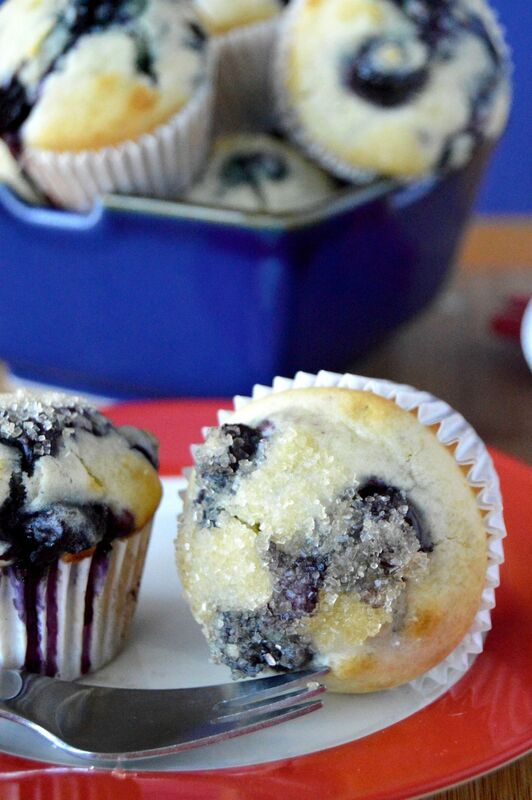 My kids love blueberry muffins on Saturday mornings! I really like the way lemon and blueberries pair so well. Interesting idea to melt butter with the lemon zest. Can’t wait to try this recipe out. Those look scrumptious! I could eat them right off the computer screen. Don’t think the screen would be tasty though. I adore lemon and blueberries together! The sugar on top of these is gorgeous! I’m going to have to make them for a brunch soon. The crunchy top with the sugar just adds a LOT to this recipe! Thanks for stopping by!